Here’s something a little different for TPA. 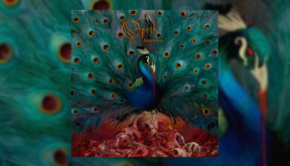 As part of their twenty-fifth anniversary, Opeth embarked on putting together a book, an inside look at the band from the perspective of the people who were there. 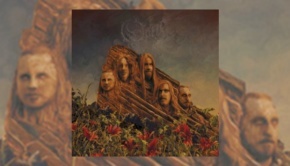 Now if you’ve followed Opeth for any length of time you’ll probably suspect that this isn’t going to be a common or garden overpriced coffee table purchase that errs well into rip off territory. And you’d be right. The packaging is lavish and the 200+ pages are packed with an in depth history of the band, some of the comments from the protagonists contradictory and showing differing perspectives, and the vignettes are always interesting. Book of Opeth is packed with scores of previously unseen images, many from the band members’ own archives, set amongst beautiful background illustrations. 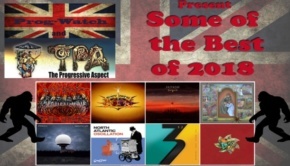 The words, told in the first-person by Mikael and the band plus former members and collaborators, are based on interviews by Dom Lawson that certainly give a feel for the times and are packed with detail. The book itself is split into three main chapters; Advent, Beneath the Sun and Cusp of Eternity which look at the forming of the band and early years, the rise to success and the recent period of global stardom. Advent is a fascinating read concentrating on where it all began as Mikael Åkerfeldt is drawn to the music and becomes part of David Isberg’s Opeth, taking over as leader after David’s departure. Mikael and Peter Lindgren discuss with a warming honesty the early days and the bringing together of extreme metal with a new found love of classic symphonic prog, Martin Méndez also contributing for the period after he joined in 1997. 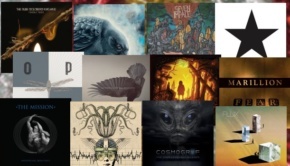 The first chapter closes after the release of Still Life, Beneath the Sun picking up the tale with Blackwater Park, producer Steven Wilson and new manager Andy Farrow now joining the narrative. The influence of both is clearly significant. The section relating to the Deliverance/Damnation sessions is fascinating and underlines the lengths to which Åkerfeldt is prepared to go to make a creative statement, even when it does not make good business sense. Likewise, the departure of Martin Lopez and Peter Lindgren after Ghost Reveries is a difficult time for the band and something of a crossroads, but the introduction of current incumbents Martin Axenrot and Fredrik Åkesson have taken Opeth from strength to strength and their words are now included. And so to Cusp of Eternity which opens with the recording of the aptly titled Watershed before moving on through the ensuing success, Opeth playing at The Royal Albert Hall in London, and on to Heritage. When discussing the departure of keyboardist Per Wiberg it is clear that Mikael still holds him in high regard but his contribution and commitment to Heritage was not as it should have been leading to a natural parting of the ways and the arrival of Joakim Svalberg which genuinely feels like the final piece of the jigsaw is now in place. The Heritage tours make for great reading as the band deal with a large degree of audience dissatisfaction as a result of the change of direction, but it is this determination to do what they want to do that sets Opeth apart and has seen them successfully expand their audience with fans from outside the death metal genre. The final section relates to the writing and recording of Pale Communion at the legendary Rockfield studios in Monmouthshire, Mikael’s excitement at this palpable. The last word is left to Steven Wilson to underline his respect for what Åkerfeldt has achieved throughout his career and the boundaries he continues to push with each subsequent release. 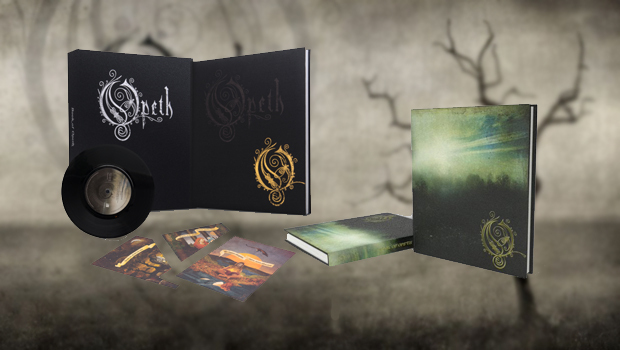 There’s an extensive illustrated Discography featuring the views of designer Travis Smith whose contribution to the imagery of Opeth has been substantial since he first worked with the band on Still Life. The cover images are discussed in terms of inspiration and realisation. We then get into the odd world of Alexander Skottene Twiss, a collector and obsessive of all things Opeth, and get an insight of when fan becomes geek collecting machine. 258 test pressings and promos is a lot in anyone’s language and he goes on, at great length and in classic train spotter fashion, regarding his rarer items with images of many prized pieces, often signed. You get the suspicion that he’s probably the kind of guy who quite scares Mikael and the band! A question though: he says has “two and a half copies” of the Watershed first vinyl test pressing. Eh? Finally and to wrap things up there’s a Roll of Honour featuring the name of everyone who pre-ordered the book and a Photo Credits section. And that’s that. The layout is engaging and easy to read, drawing the reader into the story, although there are one or two minor typographical errors within the text which is a shame but doesn’t spoil the experience. Overall this is a stunning book and a fascinating read that opens up the inner workings of the band. The photos include early and candid personal photos with plenty of studio and live material, the settings for them throughout the book being beautiful and a fine fit within the breadth of Opeth imagery over the years. Book of Opeth is available to order only from www.opethbook.com and will ship from late April. It comes in two versions, a Classic Edition in a run of 3,500 copies (£40), and a Signature Edition in a clamshell case limited to 500, individually signed and numbered by Mikael Åkerfeldt with collectable prints by Travis Smith (£250). Both come with a 7” vinyl of previously unreleased acoustic versions of Atonement and Demon of the Fall. A gorgeous set, every Gothically tinged metallic coffee table should have one.